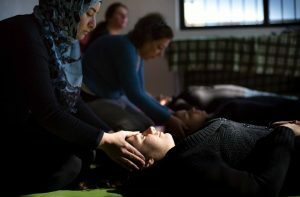 We have expanded our psycho-social programming to include Acupressure, (a blend of “acupuncture” and “pressure”) an alternative medicine technique derived from acupuncture. In acupressure physical pressure is applied to acupuncture points by the hand, elbow, or with various devices. There are hundreds of acupressure points on the entire body. It is easily learned through basic training, effective, and empowering. Like yoga, Acupressure helps improve community mental health both psychologically and physically.